·Respiratory tract infection is one of the most common diseases, accounting for 10% of hospitalized patients and several million deaths around the world annually. ·An adolescent or an adult might be infected with respiratory tract pathogens 2 to 4 times each year, while this number may double for a child. ·About 90% of acute upper respiratory tract infections and most of lower respiratory tract infections are caused by respiratory tract pathogens other than bacteria. The common pathogens include but are not limited to human respiratory syncytial virus, human adenovirus, influenza virus and mycoplasma, infections of which result in similar symptoms: fever, cough, weakness, pneumonia or non-leukocytosis. 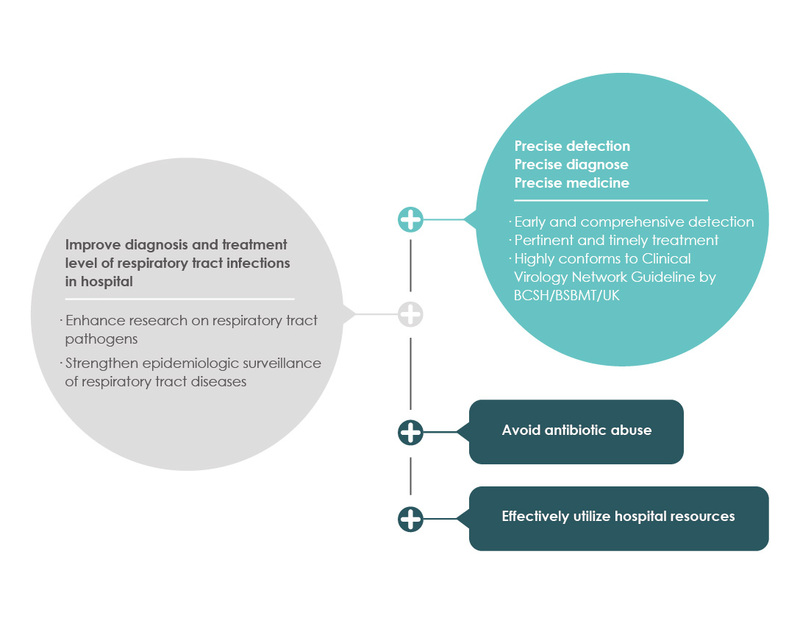 ·Timely identification of respiratory tract pathogens can guide specific treatment, reduce hospital costs, and minimize the excessive use of antibiotics. · Objective: Normalize signaling on CE platforms by standard mix; Results output by software. CE platforms (GeXP/CEQ or ABI3130/3500). · Economic: Much cheaper than qPCR (for 13 pathogens detection) and liquid chip tests. Zhang H, Cheng H, Wang Q, et al. An advanced fragment analysis-based individualized subtype classification of pediatric acute lymphoblastic leukemia. Sci Rep. 2015. DOI: 10.1038/srep12435. WANG Q, LIN G, GAO J, et al. 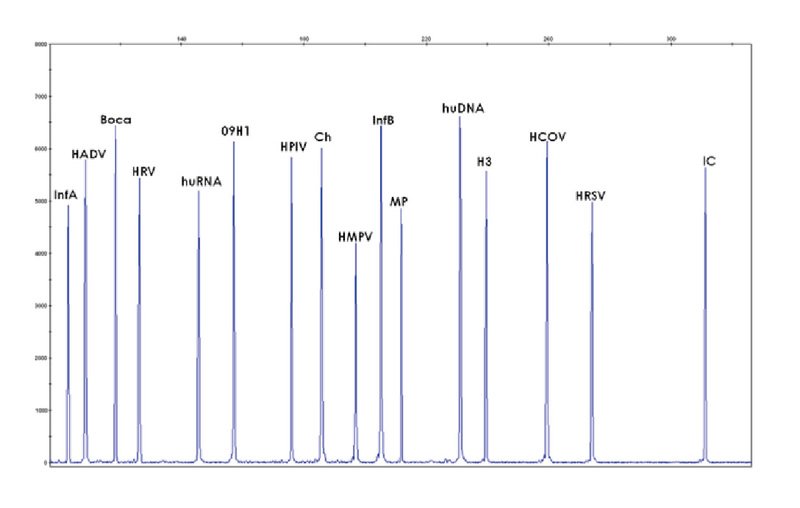 Detection of human rhinovirus in cerebrospinal fluid of children with viral encephalitis by using GeXP genetic analysis system. Laboratory Medicine and Clinic. 2015 (13). DOI: 10.3969/j.issn.1672-9455.2015.13.005. Harris AM, Hicks LA, and Qaseem A. Appropriate Antibiotic Use for Acute Respiratory Tract Infection in Adults: Advice for High-Value Care From the American College of Physicians and the Centers for Disease Control and Prevention. Ann Intern Med. 2016. 164(6):425-434. Dignan FL, Clark A, Aitken C, et al. BCSH/BSBMT/UK clinical virology network guideline: diagnosis and management of common respiratory viral infections in patients undergoing treatment for haematological malignancies or stem cell transplantation.Br J Haematol. 2016, 173(3):380-93.